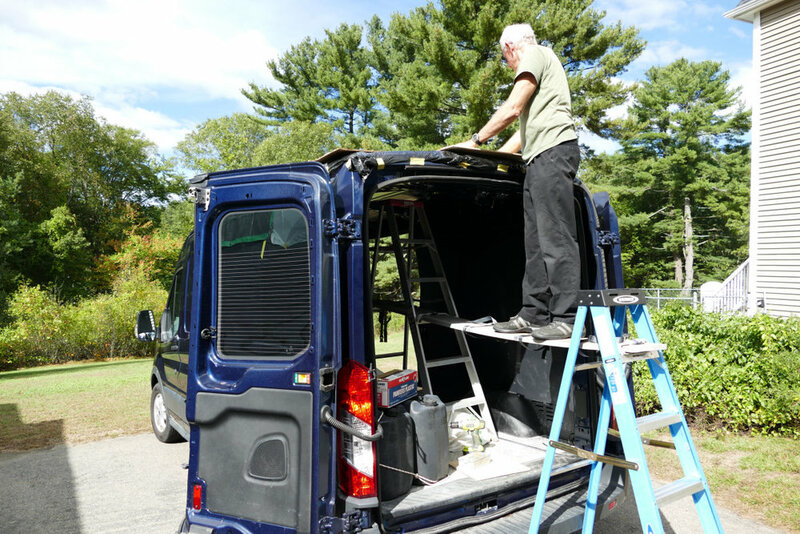 We have officially started our van conversion on Blue, our long wheelbase, medium roof Ford Transit 250. The first project was to install a roof fan and ventilator to cool down the interior when it's hot outside. This required cutting a 14" x 14" hole in the roof of our beautiful van. Well, the cut is made, and I'd say Blue has officially lost his virginity. We chose the MaxxFan model 6200K, which can be left open in the rain - a very nice feature. It can also be left open while driving. It has a ten speed fan which is thermostatically controlled, and a built-in screen to keep the bugs out. We bought the version with the dark cover to blend in better with Blue's dark blue paint. Drilling the first hole was difficult, but what I really dreaded was using the jigsaw to start the cut of that big, gaping hole in the roof. All went well, however, and the fan is now installed with nary a leak. Best of all, it didn't blow off on the trip from Boston to Virginia - although I did have a small adrenaline rush as I passed under a bridge with a meager clearance of only 9' 2". I had calculated the height to be just under 9' 0", but I didn't actually measure it. Apparently the overall height was less than the bridge clearance as I heard no crunch and saw no debris in my rear view mirror. I've listed below some of the products that were used in the project, along with their Amazon links. You can help support our website by purchasing the product using the Amazon link - your cost is the same, but we get a few cents on the transaction. Thanks!